Blaine High School's Knowledge Bowl team traveled to Yakima to compete in the State tournament on Saturday, March 23rd. Answering general knowledge questions in Jeopardy-style team rounds, Blaine's own team of five students battled in one written round and three oral rounds. 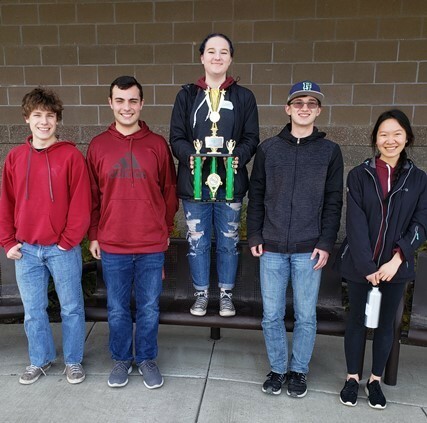 Seniors Jo Latta and Alexandra Hao along with juniors Dylan Burnett, Charles Streeter, and Terry Ryan came in 3rd place in the Washington State Knowledge Bowl tournament at West Valley High School. The Blaine team triumphed over thirteen other 2A teams with intelligence, skill, and a little bit of luck. Math teacher Mike Dahl is the coach, and English teacher Neva Coats is the volunteer. Congratulations, BHS Knowledge Bowl team! Copyright © Blaine School District 2019. All rights reserved.